We bid goodbye to Molly the Dog, and were on our way. 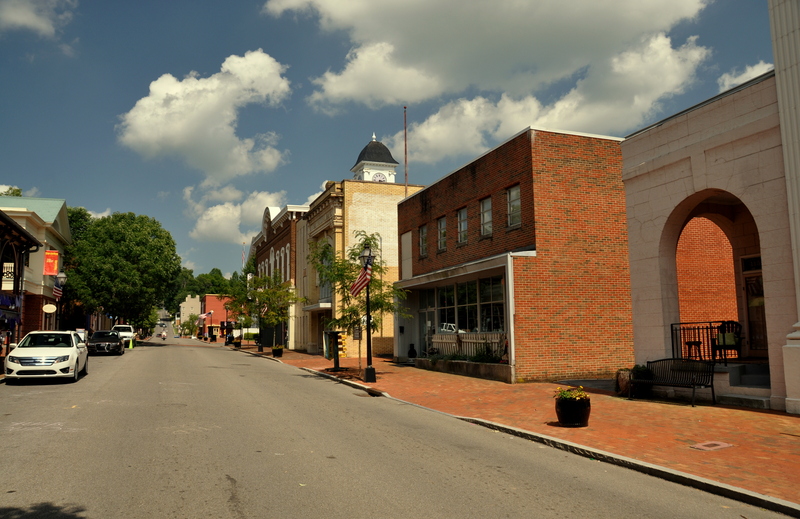 Jonesborough is about an hour southeast of where we live, midway between Greeneville and Johnson City, TN. We got off to a late start because I insisted on a late wake up, having worked until 1 a.m. the night before. As such, it was already going on lunchtime when we arrived. I applaud my parents for passing up Burger King and Hardee’s (their usual mainstays) in favor of the Olde Town Pancake House, a real find! Looks good, eh? Okay, so it isn’t flapjacks. 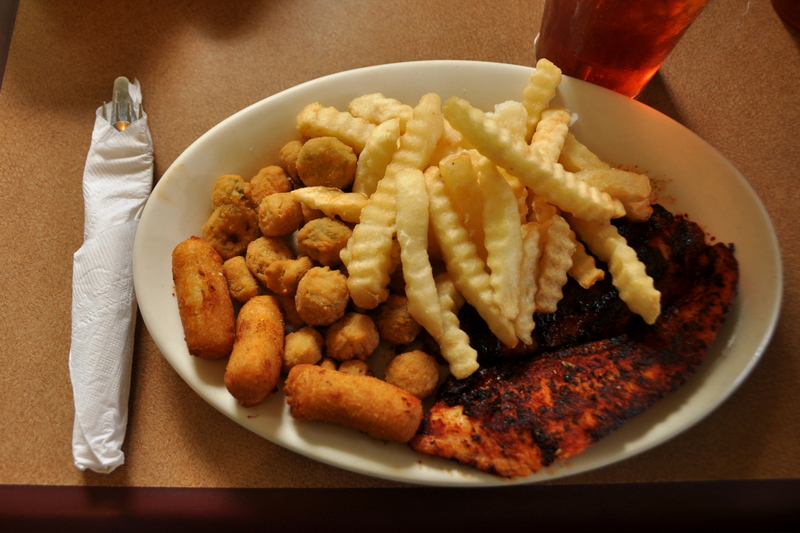 Nope, that’s blackened catfish, fried okra, hush puppies, French fries, and sweet tea. Lunch, Tennessee-style. All that was missing were green beans, fried green ‘maters, and pecan pie for dessert! Historic downtown Jonesborough (spelled “Jonesboro” for a time) was within walking distance of the restaurant, although we drove, as my parents are not walkers. “Downtown” consists of a tree-lined Main Street and several side streets that branch off of it. There is ample free parking. My dad seemed content with a 30-second look around, but my mom wanted to check out some antique stores – there are typically two or more on every “quaint” Tennessee main street. I pointed out a sign on the (appropriately-named) Jonesborough General Store across the street that said “ice cream,” and my dad suddenly decided he wanted to stick around after all. 🙂 We agreed to meet at a set of park benches beneath a shady Banyan tree, and went our separate ways. Camera in hand, I headed up a narrow side street next to the historic Chester Inn, noting a placard which indicated that former presidents Andrew Jackson, Andrew Johnson, and James K. Polk all stayed there at some point (and, incidentally, all hail from Tennessee). I noted some lovely homes situated on large lots on hills to the one side of downtown. I followed a winding brick pathway back towards Main Street, and the pathway turned out to be part of the International Storytelling Center. Jonesborough is apparently the birthplace of storytelling, although I thought Aesop had that honor. Tennessee-style storytelling consists, I think, of an elder sitting around on a rocking chair or tree stump, spinning yarns and tall tales. Guitar optional. 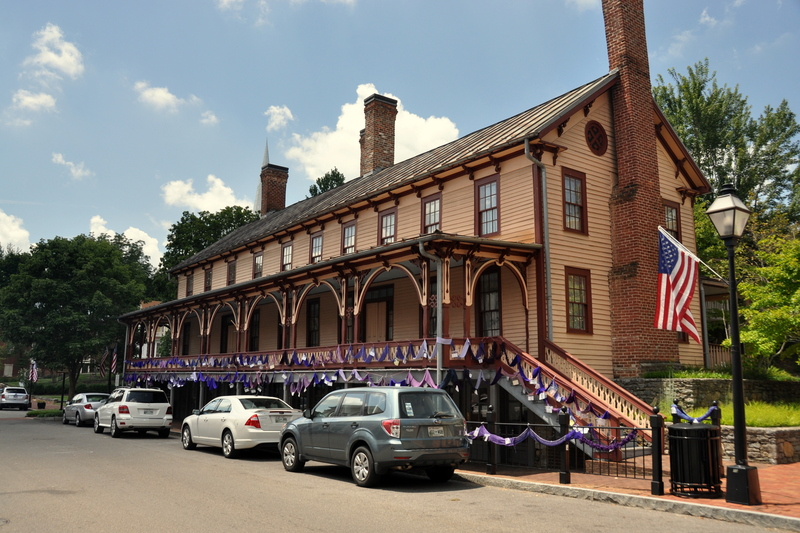 I wandered up and down Main Street in both directions, passing other historic buildings, including 200-year-old churches that reportedly still have their slave quarters inside. Crossing Main Street in the opposite direction took me to a babbling brook that I later learned was called Little Limestone Creek. Before heading back to our meeting point, I wandered east and stumbled across Old Jonesborough Cemetery, a grassy hillside burial ground that can use a bit of upkeep. 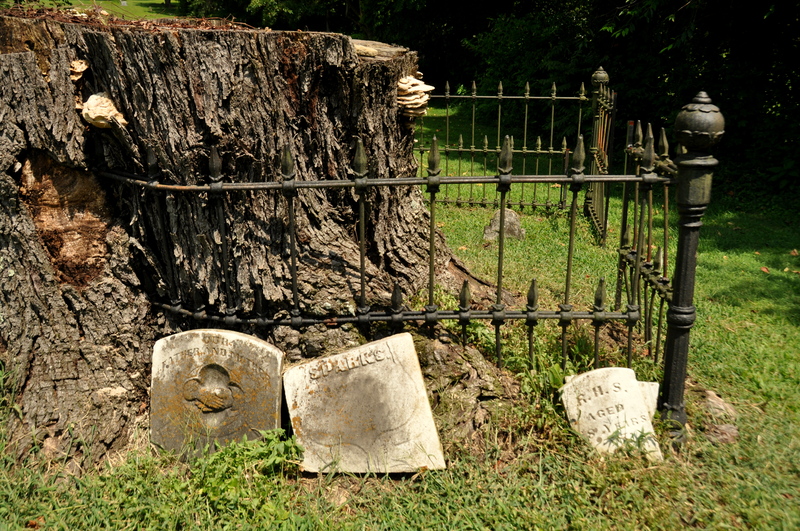 My eyes were drawn to a large tree stump, which was fenced off and surrounded by simple gravestones – those buried here were victims of an 1873 cholera epidemic. As you can see in the picture below, one of them was an eight-year-old child. 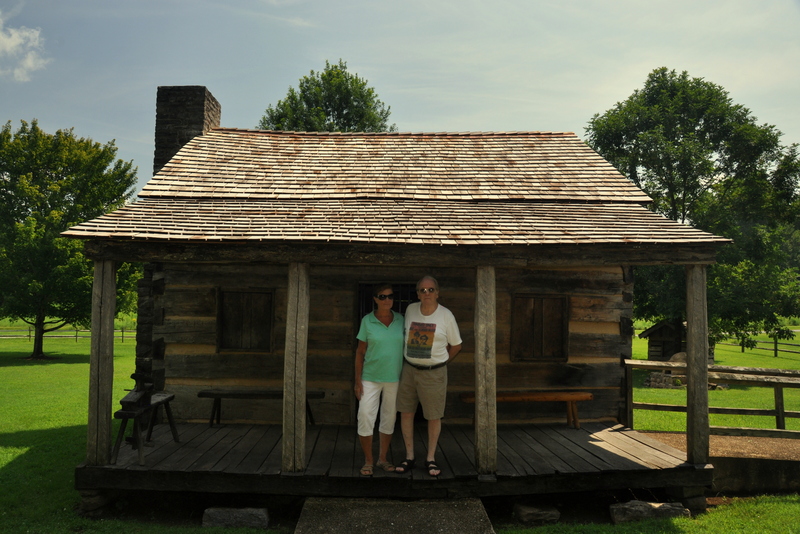 As we left Jonesborough, I learned that my parents had an ulterior motive: They also wanted to visit Davy Crockett Birthplace State Park, which was midway between Jonesborough and Greeneville. An easy-to-miss turnoff near the farm town of Limestone leads curious travelers down two miles of narrow country road, lined with corn on both sides, to the state park. There is little of note inside the Visitor Center besides the requisite rifle and coonskin cap, although the ranger directed us towards some nearby hiking trails, which I will have to explore myself one day. The main attraction here is a cabin – not original – built over the spot where the Alamo hero was born. A stone cairn near the front porch marks the exact spot. 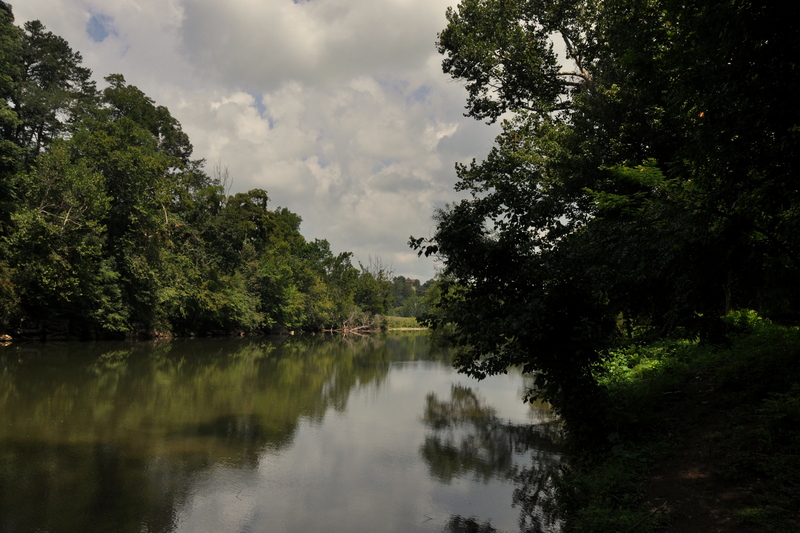 Despite the humidity, I did linger for a few pleasant moments under the shade of trees along the shores of the Nolichucky River, which flows past the cabin site. 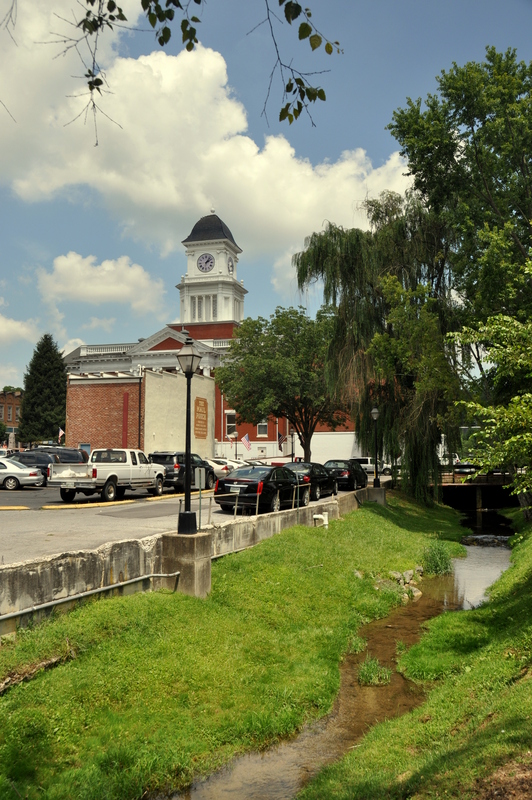 I mentioned in my last post that Jonesborough was founded in 1779, 14 years before Tennessee was a state. To clarify: It was founded as Jonesborough, North Carolina, county seat of Washington County. That county belongs to TN today but remains the first county in the U.S. named after General Washington. That, of course, would be George, our first president, whom I learned when visiting his Virginia plantation, Mount Vernon, that he preferred to be remembered as a general than as a president. Apparently, he hated politics. Pardon my rambling. 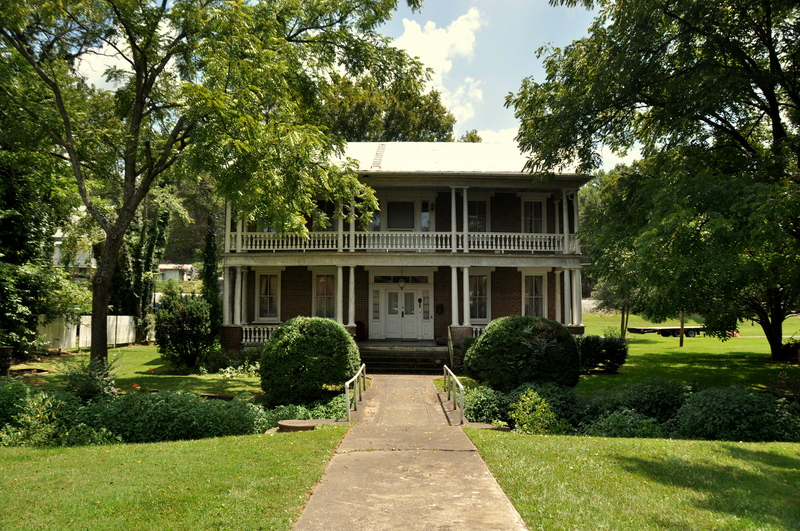 Despite stereotypes of Tennessee as a racist place, Jonesborough was also where the first abolitionist publication, The Emancipator, was published. I also learned that eastern Tennessee was not pro-slavery in general. The mountainous terrain doesn’t support cotton fields, and there is no major river port in the region, so no need for slavery. As such, Tennessee was the last state to secede from the Union prior to the Civil War, and the first state to rejoin afterwards. As for Davy Crockett, he is most famous for fighting – and dying – in the 1836 Battle of the Alamo. But his political and military history is more complicated than that. He was born in Limestone, lived for time in Morristown, TN (at 29,000 people a thriving metropolis in comparison to sleepy Limestone), and eventually was elected to the Tennessee State Legislature. Although Crockett initially supported Jackson’s westward expansion, he soon changed sides, appalled by Jackson’s treatment of Native Americans. Crockett grew up in Cherokee land, and lived and hunted in peace with his moccasin-wearing neighbors. Even today, the Trail of Tears remains one of the scars on the legacy that is the United States of America. I am a big city person at heart, but I nevertheless find small towns like Jonesborough – by any spelling – to be charming. Tennessee is full of them, and I hope to blog about others soon!